How large is the contribution of crustaceans (krill) to the diet of juvenile southern elephant seals (SES) at the Subantarctic Marion Island? 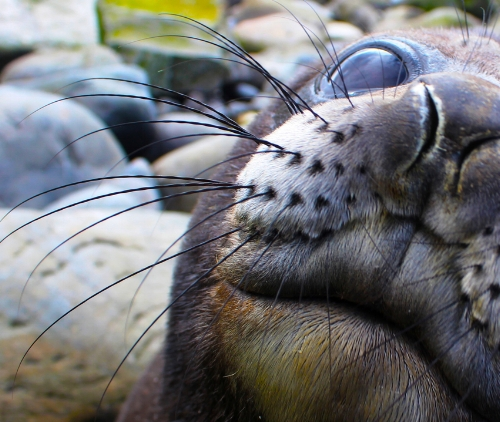 Whiskers tell us what elephant seals eat.. and when! In this novel paper, we used the nitrogen and carbon stable isotope values measured chronologically along the length of whiskers sampled from juvenile southern elephant seals Mirounga leonina to test the recent suggestion that they “represent a new krill predator within the Southern Ocean” (Walters et al. 2014). Stable isotope analysis is based on the principle ‘you are what you eat’, and we have reconstructed the diet of juvenile SES based on the biomolecule composition of their whiskers. This paper follows from an earlier study that quantified the regrowth rate of the whiskers sampled from the juvenile SES (Lübcker et al. 2017). This first, time-integrated dietary reconstruction of juvenile SES at Marion Island showed that they consumed prey from a lower trophic level than previously assumed. The depleted stable isotope values of nitrogen (δ15N) (8.5 ± 0.6‰) measured in their whisker during the independent foraging period confirmed that up to 76% of their diets consisted of crustaceans, presumably Subantarctic krill species. This is contrary to earlier studies which suggested that they consumed mostly lantern fishes and squid. This first utilisation of the isotopic values captured along the length of whisker regrowths confirms the inclusion - and importance - of crustaceans in the diet of juvenile SES and has important implications for their conservation.